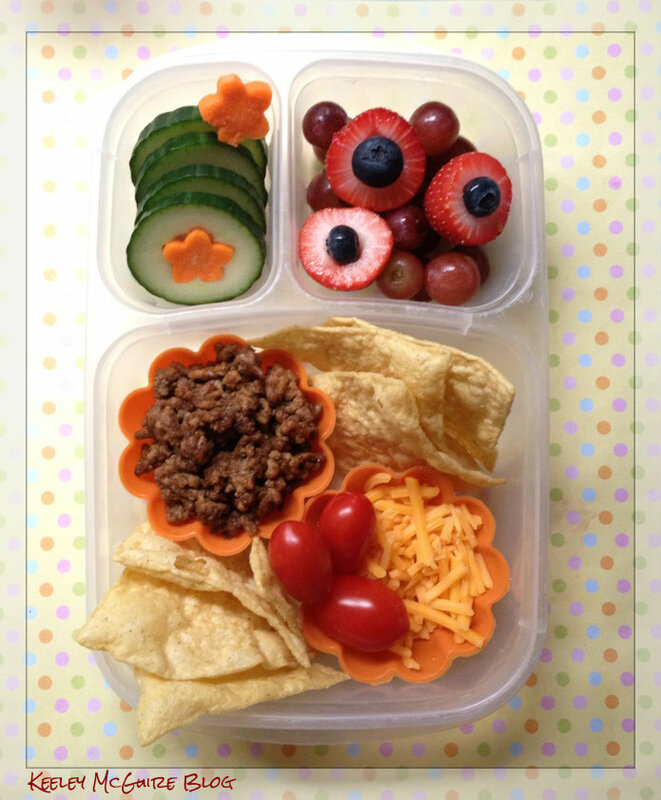 Gluten Free & Allergy Friendly: Lunch Made Easy: Not'cho Lunch! Lunch Made Easy: Not'cho Lunch! We had tacos for dinner this evening, so Little Miss loves when her lunch gets to reep the benefits of leftover taco meat. In silicone cups, she has leftover taco meat and the other cheese. Surrounding it are corn tortilla chips and three cherub tomatoes. Top left has cucumber slices and carrot flowers. I cut the center of she cucumbers out with my flower shaped veggie cutter and stuck a flower shaped carrot slice inside each piece. Top right are strawberries that I hulled a small hole out of and stuck a blueberry inside. There are red seedless grapes surrounding them. Great question! By lunch time it's at room temperature, which sometimes she doens't mind. However, we are lucky that she has a microwave in her classroom that she can use to reheat items, if she wants. That's why I will pack it in a little silicone cup so she can warm it right up in that cup. Thanks! What about keeping it warm? Or heating up the meat?